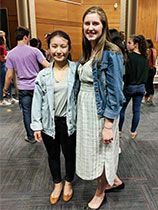 On May 24 and 25, Cindy Xu ’19 and Emmeline Tovey ’18 participated in the V1STA One Act Play Festival at St. George’s School along with senior school students from seven other independent schools. Over two nights, students performed 11 plays and showcased incredible acting, writing and direction. Ms. McAllister selected a play for Cindy and Emma called “Final Placement,” which follows the interaction between a social worker (Cindy) and a distraught mother (Emma) as they recount loss, choices, and the struggle to do what is right. It was an exceptional performance—you could have heard a pin drop in the theatre! Festival adjudicator Laara Sadiq, an award-winning actress, praised the sophisticated choice of play and Cindy’s and Emma’s commitment to character. Ms. Sadiq complimented Emma’s ability to sustain an impeccable accent throughout the emotionally charged performance, and awarded Emma the Best Actress Award. This marks the third year that a WPGA student has received this award (by three different adjudicators!). What’s more, Ms. McAllister was named Best Director out of the seven schools represented. Ms. Sadiq noted Ms. McAllister’s ability to not only recognize but to also bring out the potential in her students. She complimented her on not being afraid of putting “tough subjects” on stage and appreciated the intentionally simple staging and direction, which created space for authentic storytelling and performances. Catch the Theatre Company 11/12 class, including Cindy and Emma's play, on Friday, June 1. The performances start at 7pm at Studio 16 (1555 West 7th Street). Tickets are free; please email Ms. McAllister for availability.